In the new sector northeast of Eilendorf, the 1st and 3rd Battalions sent out patrols to clear out the enemy groups that had been detected in the orchards and houses about a mile from the battalion positions. There was some stiff fighting before the combat patrols were called in. Heavy shelling of the 3rd Battalion area lasted throughout the night. A 1st Battalion patrol located an ammunition dump and artillery fire directed upon it after the patrol returned blew this enemy dump. The 1st Battalion sent out three patrols, but these reported no enemy contact; the 3rd Battalion sending out patrols northeast of Eilendorf ran into intense fire from enemy pillboxes. TD fire directed against these just bounced off the sturdy fortifications. About 0005-0200 hours enemy patrols attempted to probe battalion positions, but were driven off in sharp clashes. About 0700 hours, 88mm gun fire landed in the 1st Battalion positions, but no casualties resulted from this. Harassing fire was laid down all night on road junctions, pillboxes and weapons emplacements and railroads. The expected fighting in the woods had brought up the question of using light machine-guns instead of the heavy machine-guns which were more cumbersome. It was decided that heavy weapons companies would be given some light guns in addition to the heavy machine-guns to employ when supporting rifle elements committed in the assault upon enemy positions in the woods. Patrols sent out by the 2nd and 3rd Battalions reported no enemy contact. Attempts to capture a prisoner for questioning failed. Another attempt on the following day to get prisoners also failed, the patrols reporting no enemy contact. Blue flares were used by the enemy on 7 November in front of "L" Company positions, but no attack materialized. Some mortar fire laid down on the enemy positions. New area to be occupied by the regiment, below Schevenhütte was reconnoitered by the three battalions. During the night the 3rd Battalion was relieved by the 18th Infantry, and the 1st reverted to 16th Infantry control. supporting 47th Infantry in Schevenhütte, Germany, September 1944. The same spot today, Feb. 2013. By 1500 hours 8 November the 3rd and 2nd Battalions, with Company "C", 745th Tank Battalion closed in the new area. Except for active-patrolling which revealed little enemy activity from 8 through 15 November, all was quiet. Prior to the 2nd Battalion jumping off in the attack through Gressenicher Forest, a bombing mission was executed against the enemy positions in front of the battalion positions and on the roads and towns to the north and east of Schevenhütte. The 2nd Battalion reported that intense mortar and artillery fire hitting the trees was inflicting casualties upon the advancing companies. The enemy was well dug-in and defended the clearings, fire-breaks and trails in the woods with mortar and machine-gun fire. Progress was extremely slow, for the thick woods meant that the areas the battalion moved through had to be thoroughly cleared. Enemy observers with radios were hiding in the woods and calling down fire on the companies they observed advancing. The muddy terrain made passage for vehicles difficult and necessitated clearing new paths through the woods by engineer details. The 1st Battalion was alerted to move one company to cover the gap between the 3rd Battalion and elements of the 8th Infantry, and to protect the rear of the 2nd Battalion. The enemy's use of two man bunkers to cover the trails also caused some confusion, since the hostile groups often allowed battalion elements to pass them and then fired upon the groups following the advance elements. Darkness coming early in the woods, it was necessary to. button up for the night at an early hour so that the men could dig shelters with overhead cover from tree-bursts. As worked out by General Huebner, the artillery laid down heavy fire on positions in front of the battalions and the 2nd Battalion continued its attack at 0800 hours. The battalion ran into mines and wire defenses covered by fire. An enemy pillbox which was overrun was discovered containing an American light machine-gun. In an effort to speed up the 2nd Battalion's advance, a company of the 1st Battalion was committed to its left, to work up a ravine which ran north, to the road which headed towards Schevenhütte. "A" Company worked through the ravine to a position on high ground, which was subjected to heavy enemy artillery and mortar fire from the north and east, inflicting heavy casualties upon the company. Little progress was made. 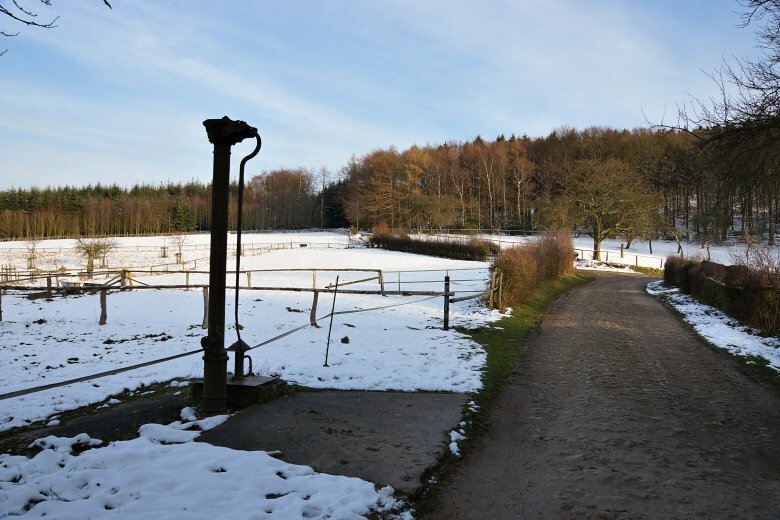 As the 1st Battalion moved north of Schevenhütte, the 3rd Battalion moved into the vacated positions. Engineers were called up forward to clear new paths or improve the narrow trails which were under heavy fire. "C" Company had moved to "A" Company positions with "B" Company following. "C" Company ran into a firefight with an enemy group, and until the extent of the enemy force was determined, the other two companies were not committed. The 2nd Battalion remained in position, while the tanks and tank destroyers were brought forward to place bunkers and pillboxes in the area under fire. "C" Company patrols having developed the enemy defenses, "B" Company was then committed to the right of "C" Company. Slow going was reported by both companies. Enemy patrols attempting to probe "E" Company positions were driven off with casualties, and three prisoners of the 115th Grenadier Regiment were taken. The 3rd Battalion was committed to move through the 2nd Battalion positions. 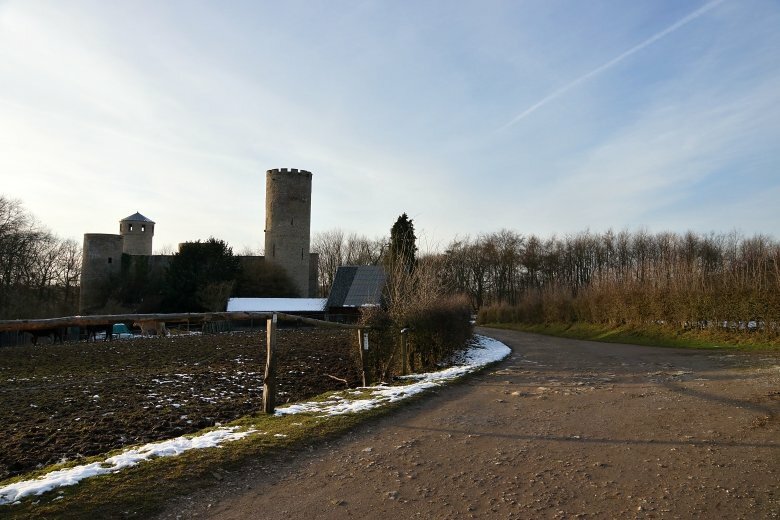 The tank dozer spearheaded the 3rd Battalion movement through the woods as it worked to Hill 272 and the road junction to the east of Laufenburg. An enemy attempt to turn the 2nd Battalion flank was aimed at "G" Company's positions northeast of Schevenhütte, but the company held and the enemy attack beaten back with heavy losses. "C" Company was still engaged in clearing up its area around 145, and in working towards the road leading to Schevenhütte, where the 16th Infantry had established a roadblock on the Wenau-Schevenhütte road. By 1600 hours both 1st and 3rd Battalions were reported on their objectives and were ordered to dig in for the night. The attack called for the 1st Battalion to move west towards the road and then north towards Wenau. "A" Company moved out, with "B" and "C" holding their positions in the ravine and on the hill overlooking the road. Both 2nd and 3rd Battalions were under heavy artillery fire. The 2nd Battalion had another attack launched against it by at least one battalion or more of the 115th Grenadier Regiment, whose mission was to clear the woods up to Schevenhütte. In close fighting, the enemy thrust was hurled back. By 1400 hours the 1st Battalion had reached its objective. The 4.2 mortars were placed in the ravine covering the road. Heavy enemy attacks against the 16th Infantry positions kept the 1st Battalion in position, as it reverted to Division control as its reserve battalion. As soon as it was evident that the enemy attack had been contained, the 1st Battalion was released to the regiment at 0930 hours. The 3rd Battalion as counterattacked, but that thrust by enemy infantry was also beaten back with heavy losses, and the 3rd Battalion swung into the attack which was halted by the intense enemy mortar fire. 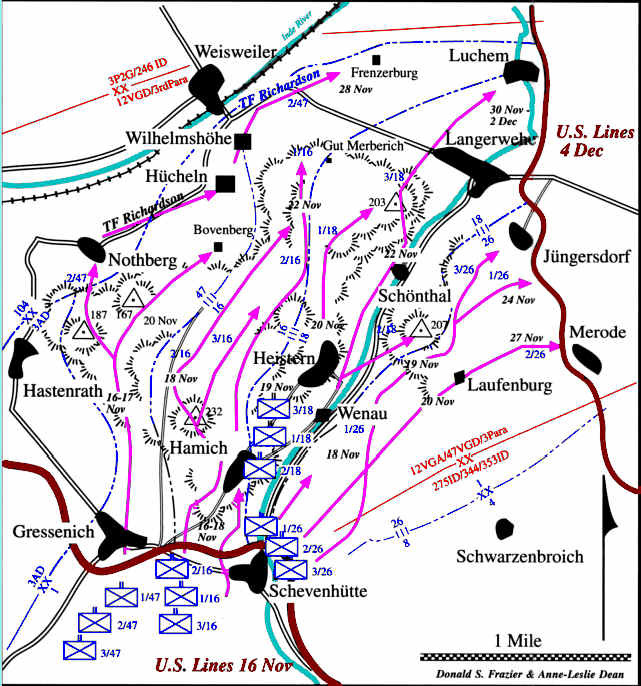 The 1st Battalion by 1130 hours had been committed to pass through the 3rd Battalion positions and move to the east, above Laufenburg. Hard fighting by the two companies committed, "B" and "C", resulted in some progress. The 1st Battalion continued to attack towards the road junctions near the triangulation station at 244.5. The two combat patrols sent out by the 2nd and 3rd Battalions ran into heavy resistance and had to pull back. Casualties were heavy. "E" Company was counterattacked, but held its ground. One of the prisoners captured claimed that the attack had been launched with the idea of preventing our battalions from continuing their attacks. "L" Company in the forward move reached 155, and headed towards Hill 200. 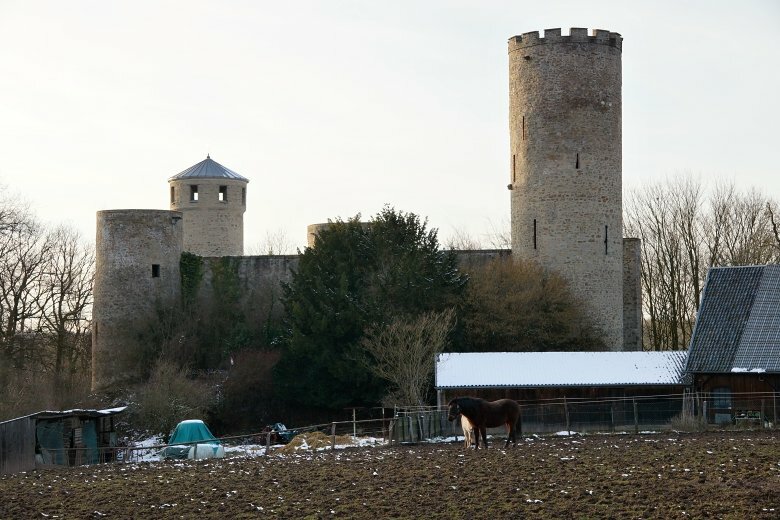 "C" Company moved into the castle which had been part of the 3rd Battalion positions. A cavalry group from JIVE relieved "E" and "F" Companies for the forward move. All three battalions were ordered to stay in their respective areas and mop up enemy snipers and small groups which had been bypassed in the forward moves. The weather allowed planes to strafe and bomb targets to the north of the regimental positions. Mopping up in the battalion areas continued. At night, the 3rd Battalion OPs were placed under enemy searchlights which made spotting difficult. These when placed under mortar fire were extinguished. Throughout the night there were sharp clashes in "A" and "B" Company areas as enemy groups sought unsuccessfully to penetrate their positions. In the morning, patrols from "A" Company worked towards the patrol sent out by the cavalry and mopped up enemy groups and one machine-gun emplacement in all-day fighting. 2nd and 3rd Battalion positions were static, but heavy mortar fire was laid on enemy positions throughout the day. "G" Company tied in with "C" Company, while the 3rd Battalion moved towards Jüngersdorf at 1500 hours. "L" Company reached objective at 1550 hours, followed by "I" Company, while "K" Company secured the high ground overlooking the town. The fighting for the town was heavy, and parts of the town were still in enemy hands when the 3rd Battalion reported itself on its objective. Tanks and TDs moved up and reached the infantry in town, helping to clear out enemy strongpoints. In the early morning hours, the 3rd Battalion laid down defensive fire upon some enemy machine-guns, silencing these. 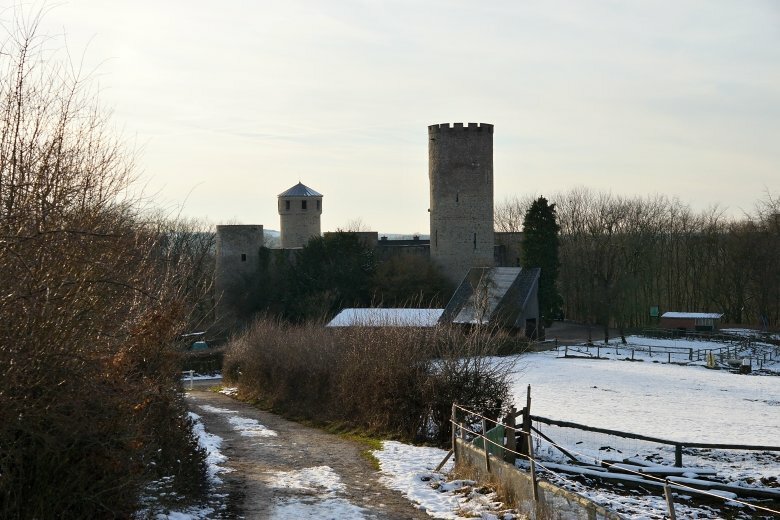 Both 1st and 2nd Battalions held their positions, with the 1st Battalion mopping up enemy groups in the vicinity of the castle. At 1000 hours the enemy counterattacked "K" Company's positions on the heights and was beaten back after an intense struggle. Two TDs sent to support "K" Company failed to tie in with the infantry, and these were attacked. One of these was destroyed by enemy groups before a platoon of Company could reach them. About 1100 hours a 57mm gun at 1200 yards range placed a Mark IV tank under fire and destroyed it. An enemy ruse was detected while a friendly flight of planes was above Jüngersdorf. Capitalizing on the fact that friendly artillery batteries had been marking targets with red smoke shells to be bombed by the air force, the enemy laid red smoke on the town. The trick was detected in time. Following hard upon a heavy artillery barrage, the 2nd Battalion moved towards the town of Merode at 1000 hours. By 1030 hours the battalion had passed the 1st Battalion positions and reached a point directly east of Merode. Considerable enemy mortar and small-arms fire was encountered in the move. By noon, the two leading companies, "E" and "F", had reached the western edge; of town, and requested that the tanks and tank destroyers follow the infantry into the town, where heavy fighting was in progress. The infantry was receiving heavy enemy artillery fire from Schlich, and an air mission was requested on that town and positions to the north of it. Last reports from "F" Company placed enemy infantry supported by tanks thrusting against their positions. A combat patrol sent out to contact the two companies was turned back by heavy enemy mortar, machine-gun and small-arms fire, and by tank fire. 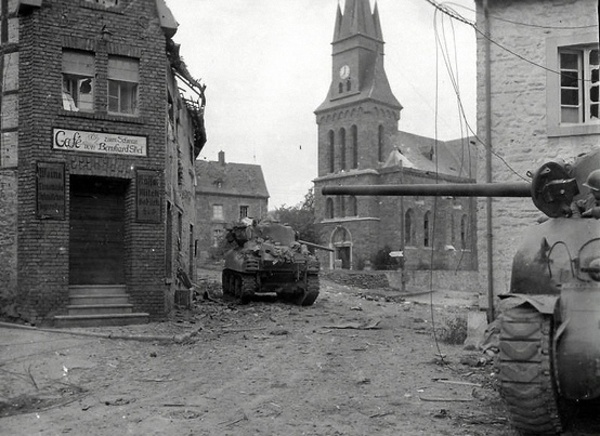 Attempts to pull bogged down tanks, which were blocking the way for other vehicles, cut of the road leading to the town were futile, since the trails were under artillery fire. Artillery fire was laid on the far end of the town at 1105 hours. The day passed with no news from the two companies. At 1845 hours a prisoner gave some idea of what had happened. 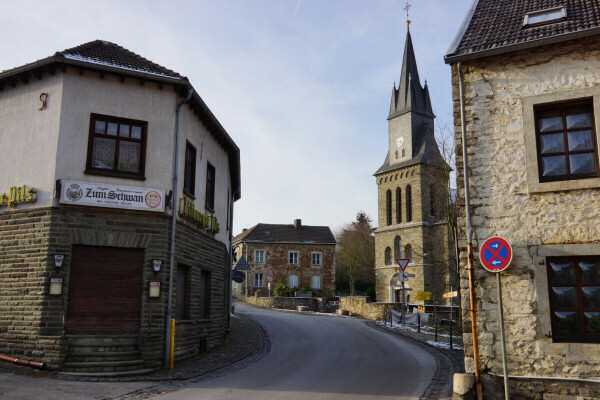 German infantry and tanks had cut the companies off after they had entered the town, closing in on them from the woods above and below the town. In the evening, the 1st Battalion, 18th Infantry relieved the 3rd Battalion. Plans were drawn for using the 3rd. Battalion to drive on Merode and relieve whatever elements of the two companies were still holding out. October had found the regiment engaged in clearing the city of Aachen from the enemy: November had found the unit fighting through the enemy defenses in the Gressenicher-Woods and reaching the open ground west of Düren.